My strongest opinion in this race is that I just didn’t want any of the horses coming out of the Apr. 15 maiden race won by Exclusive Zip or the May 3 maiden race won by Whatstotalkabout. Horses like Elenzee, Positive Energy, and Conquest Falcon all ran reasonably well in those races, but the fields were pretty bunched at the wire and I think they’re all landing in a marginally tougher spot today. The new face that I find most intriguing is BARTLEBY (#14). 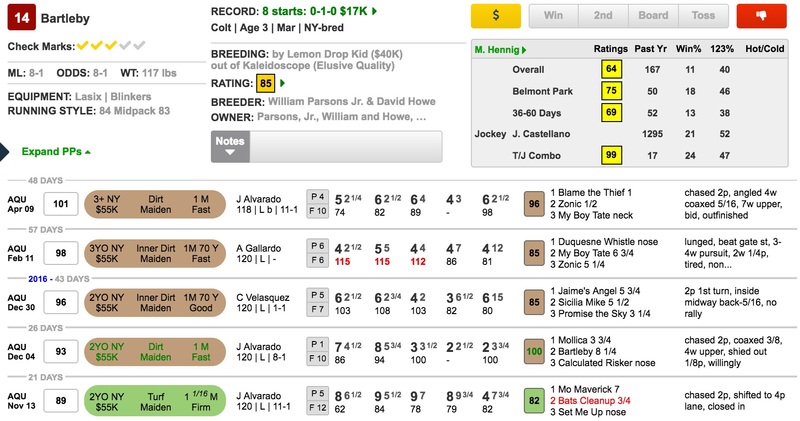 He ran better than the published running line suggests in his lone turf race last fall after encountering trouble at two key points. He was squeezed back coming out of the chute as the eventual winner crossed over heading into the stretch for the first time. Then, at the quarter pole, he got caught in behind some tiring runners and had to alter course back down inside to make his run. Despite having lost momentum, he really picked it up in the final furlong, passing horses quickly as the field crossed the wire. He’s a horse with a very short burst of speed, so I think he’ll appreciate this one-turn mile. The other horse that I want to use is first time starter CAVALLOTTO (#3). H. James Bond knows how to win with a debut runner, and this gelding has plenty of turf pedigree. He is a son of good turf influence Tizway and is out of a dam that has produced two grass winners, including multiple grass winner Campogiovanni, who was campaigned by these same connections. He’s apparently been working forwardly for this debut.